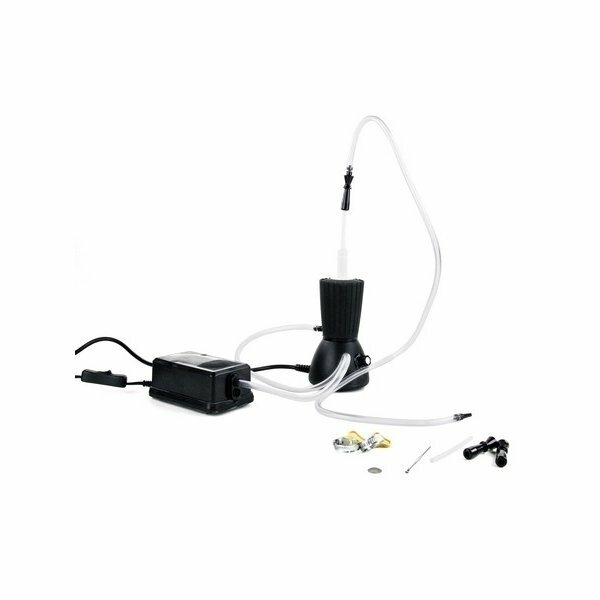 The HerbalAire Vaporizer is a multi-purpose vaporizer that can be used a direct inhale machine or as a forced air fill (like the Volcano). It is constructed with a Teflon outer shell and mouthpiece and has a nichrome wire-heating element with a temperate aluminium outer shell. The HerbalAire forced air vaporizer with dual functionality has been made by the Canadian manufacturer Bohdan Petyhyrycz since 2005. 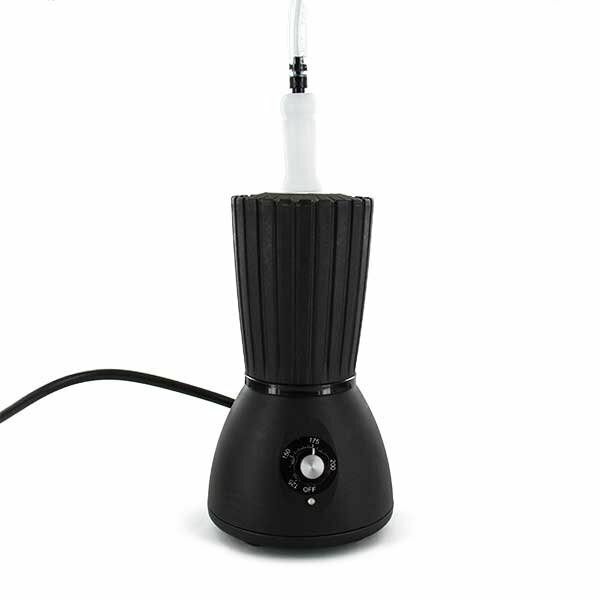 This 7-inch (18 cm) tall, portable and affordable vaporizer boasts a solid construction and superior extraction capability - one of its main advantages over other vaporizers (it is currently being used in China to research the effectiveness of vaporizing Chinese herbal medicines). One of the features that sets the HerbalAire Vaporizer apart from its competitors is that there are 18 tiny jets of air that permeate the herb only when the user inhales or the fan is turned on. This allows it to extract the active herb ingredients using the lowest temperature for maximum energy efficiency. Set your desired temperature (121°C - 205°C, accurate within 1°C) and an LED alerts you when it's ready, which can be as soon as 2 minutes! Drop loaded crucibles into the large chamber, attach large Teflon main mouthpiece to the chamber, and start vaporizing! Alternatively, fit a bag onto the mouthpiece extension. 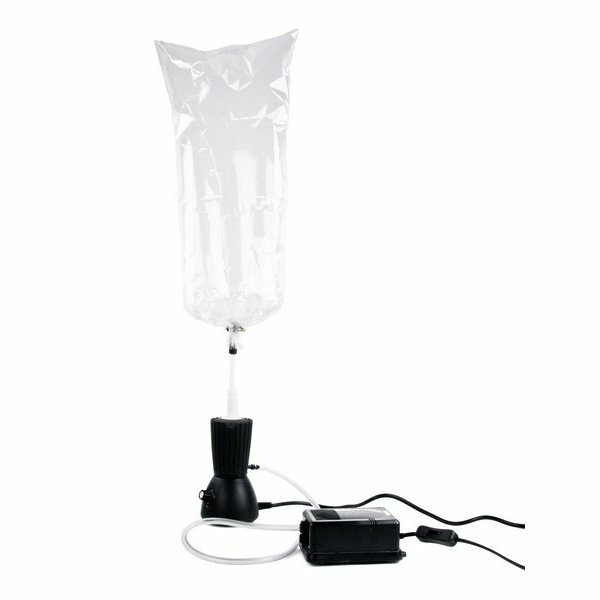 Turn up the pump and watch the bag fill with that desirable vapor! You can inhale from one bag while another one fills up. 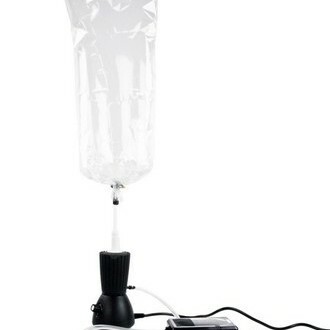 The HerbalAire automatically shuts off after 30 minutes of inactivity. To clean, simply remove the mouthpiece and dump out the crucible containing the used herb. A metal tool is provided to loosen any that’s got packed tight. Mouthpieces can be washed with water, or more thoroughly by placing with some rubbing alcohol in the plastic tube provided, let it soak for a while and then rinse. There are no small pieces to take apart. HerbalAire offers a full 3 year warranty on every HerbalAire purchased.